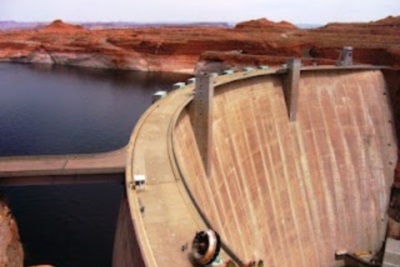 Glen Canyon Dam in Arizona. From water wheels to solar power, we are constantly adapting our energy sources in today’s world. Traveling allows you to see where the energy you use every day is produced and where scientists and engineers are studying new methods to produce energy. Even the old methods of energy production are fascinating. 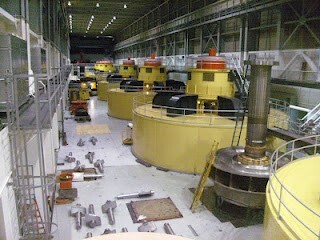 Many areas have museums or tours available to see energy production behind the scenes. Water wheel at Spring Mill State Park, Indiana. The gristmill for grinding grains is inside! Probably the oldest version of energy comes from the power of water running down a river. 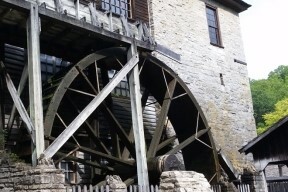 You can see their importance in history with many water wheels that powered sawmills or gristmills. These are located throughout the United States. Water is still an important source of energy. Dams and hydroelectric plants are also located around the country. Some of the bigger plants have tours. The best tours and museums include the Hoover Dam, the Glen Canyon Dam, and the Niagara Power Project Visitors Center. I found it interesting that electricity is just considered a byproduct of a dam. The main purpose of these dams is to control water flow. Coal mining tours taking you underground can be found in several states, including Pennsylvania and West Virginia. Some of them include guides that used to work the mines. 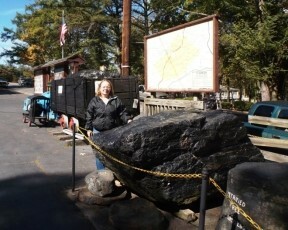 Before starting our tour at Pioneer Tunnel Coal Mine in Pennysylvania. Power plants using coal, natural gas or nuclear can be found all over the country. Unfortunately, only a few have tours available and these seem to be by appointment only. Included in these limited tours are a nuclear plant at Duke Energy in North Carolina and the Comanche Peak Nuclear Power Plant Visitor Center in Texas. You may want to check with the local power plant near where you are camping. Oil wells are seen along the road in many places throughout the United States. From the beaches of Texas and Louisiana you can see offshore oil rigs in the Gulf of Mexico. Some towns like Odessa, Texas, are all about oil. There are machinery shops, pipe companies, and stores devoted to oil well parts. Interestingly, the town has a lot of chiropractors, physical therapy businesses, and injury law firms. I assume it is a tough business. Texas, Oklahoma, Pennsylvania, and California have several oil museums. These museums can give the local history of the oil business along with explaining the geology that leads to oil formations. 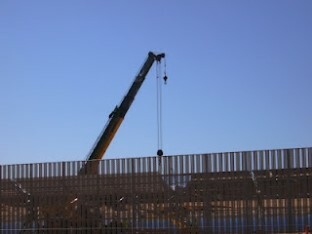 Construction of the parabolic trough system in Gila Bend, Arizona. While states like Arizona, New Mexico, and Florida have the greatest concentration of solar radiation, solar panels can be seen all over the United States on houses, various buildings, fields, and even RVs! While solar panels are widespread, other types of solar energy plants exist. Concentrated solar power using parabolic troughs are used in several large plants, including the largest in the US located in Gila Bend, Arizona. Other large trough types are in Martin County, Florida, the Mojave Desert, and near Las Vegas. Ivanpah Solar Power Facility is a large farm in California where mirrors focus on three central towers and can be seen from the road. 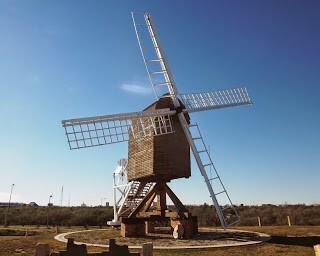 Old English-style windmill at the American Wind Power Museum in Texas. We like to watch for wind farms wherever we go. Texas is known for oil, but the state is also home a great many wind turbines. Texas tops the country in wind power capacity followed by Iowa, Oklahoma, California, and Kansas. Wind power tends to be located in the central plains, near oceans, hills, and in other windy locations. The American Wind Power Museum in Lubbock, Texas is an incredible museum showing both historical windmills used by farmers to pump water and different modern types of wind turbines for power. The Mid-America Windmill Museum in Indiana displays more of the older windmill types. The Wild Horse Renewable Energy Center in Washington has an excellent museum explaining current wind turbine technology and the operation of a wind farm. The tour even brings you inside the base of a wind turbine. Wear a jacket if you visit. It is windy! Watch as you drive the United States to see how our energy sources change with geography and over time.